The Super 9 has been designed in Ireland for the Irish and UK markets. What does this mean to you as an owner or as an operator? Firstly, it ensures the Harris Group is here to protect the You, the customer, but moreover to bring stability and reassurance with assured parts, technical assistance and all the assets required to maintain and grow the your investment in the Higer brand. When the Super 9 was designed, the basic specification of the vehicle was predetermined by what the bus and coach industry told us they wanted in a midi-sized coach. We then insisted the vehicle components used in the construction of the coach would be past-sourced from blue chip suppliers. Many of the parts used, are from internationally renowned suppliers with dedicated supply routes in Ireland and the UK, making parts supply simple - not just today but also into the future. 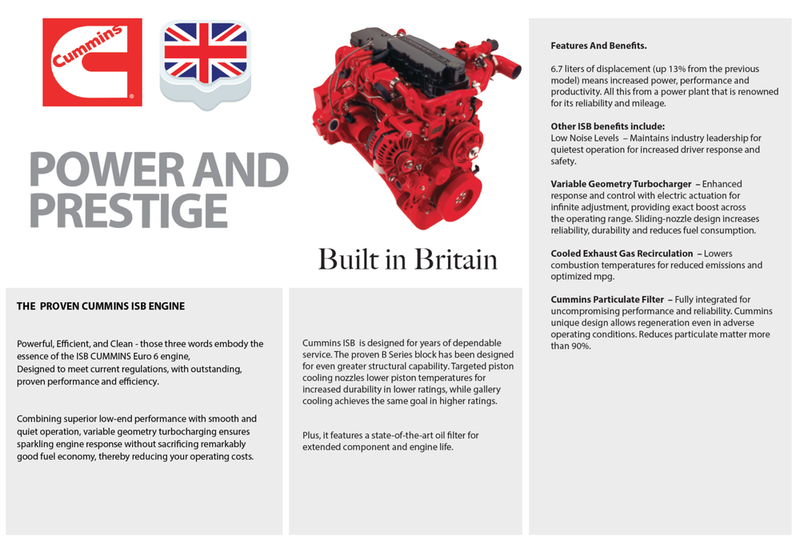 When you see products like a Cummins Engine, ZF Gearbox, Firestone airbags, Waco braking system and electronics, Spheros AC system, Isringhausen driver's seat, Michelin tyres and many more renowned brands, then you begin to understand we have built the Super 9 to be a market-leader not a follower! WHO THINKS ABOUT THE DRIVERS COMFORT ? AT HARRIS AUTO, WE DO. We believe, the driver's seat should be the best seat in the house or the coach. Right in front of you is the ellipsoid dashboard with easy-to-read instruments. At the centre, the drivers information display system allows you to use the on-board computer to display vehicle data and to control a whole host of other functions including access to the on-board diagnosis system and other information devices. That's why at Harris Higer, we believe Professional drivers will appreciate the ergonomically optimised workplace we have created, which makes the drivers job easier, enabling him/her to concentrate on driving, turning your working environment into a comfortable space designed for you. What defines a luxury coach today? Is it the manufacturer, Brand, design, ride quality, and advanced technology which is not typically not found in other vehicles. Or is it simply a matter of price – that is the willingness of a consumer to pay a premium for the status associated with certain brands? Only you can answer that question honestly because we all have our own outlook on what is important to our business model, our corporate situation and our Customers requirements. It is fair to state that the term “Luxury” ultimately has a cost, however with the Super 9 we have included the luxury touches at no extra charge, thus creating a premium traveling environment, and in so doing this, have provided added Luxury a no extra cost standard. Now that's sophisticated! Comfort begins with the visual perception of the interior of a coach, so all Super 9 coaches have been fitted with a number of mood light settings changing from soft blue to brilliant white, at the flick of a switch. Blue LED overhead marker lights provide passengers with a point of reference when it's dark. This is due to the indirect lighting concept that creates a pleasant sense of space activated by the auto headlights-on function. Natural light is filtered by the UV protection system, fitted to the tinted glass, helping to ensure ensuring that all available daylight is used to brighten up the passenger compartment. There are two separately operable reading lamps above each seat for passenger convenience. Additionally, indirect LED lighting is fitted to the aisle and step areas, improving passenger visibility and safety, for entering and alighting the Super 9 day or night. Seating comfort is a must particularly over long distances. For the Super 9 we have chosen high-quality Vega seats as standard. There is a choice of three colour options each incorporated into the appropriate colour matched interior. All seats are fitted with side-out operation, reclining, adjustable armrest, twin USB charging points, aluminium footrests, retractable table with cup holder, coat hook and magazine. Removable “Vega Air-Pillow™ ”colour co-ordinated headrests are also fitted for maximum comfort. This is where the EcoLife Coach gearbox demonstrates it's advantages over manual and automated transmissions – with 25 percent more torque available and designed for a much longer service life. The EcoLife challenges the roads and slopes. Up to 2,300 newton meters of torque and 6 speeds ensure high average speeds at low engine revolutions, thanks to a higher constant axle ratio. That means the engine can always supply full torque, without disengaging and engaging the clutch, and without losing speed during gear-shifts. 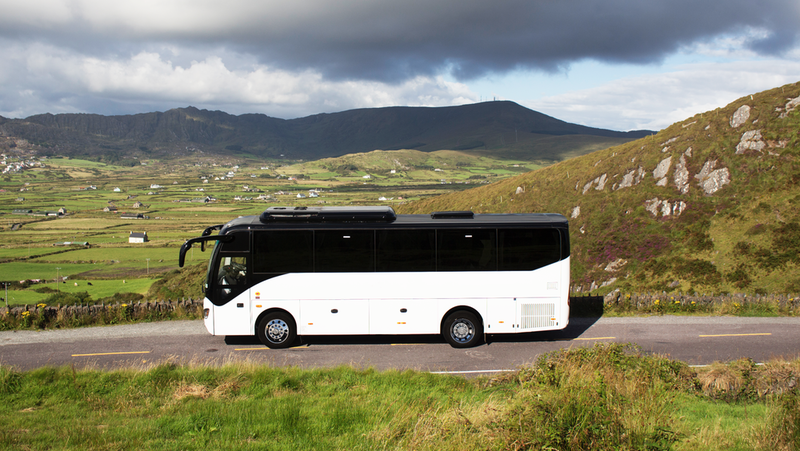 The Super 9 XL Euro6 C is fitted with the ZF Super economy and power button - a first for a MIDI coach. 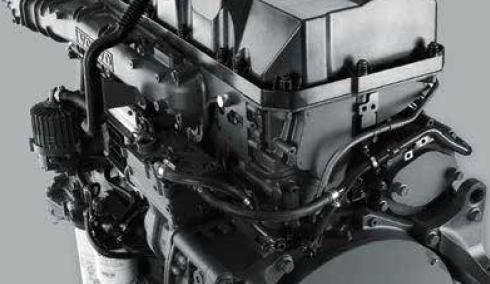 The Super 9 comes fitted with the renowned ZF Steering system. The ZF high-performance steering system is designed to be long lasting and hard wearing, which is trusted by many of the top global vehicle manufacturers for over the past 100 years. To complement the steering system, ZF Sachs shocks have also been fitted to the Super 9. The Super 9 is fitted with independent front suspension and precisely-sized and tuned stabilizer bars . This design, engineered to complement the ZF power steering system, provides exceptional directional stability, condence-inspiring road feel, and first class precision road handling. The Harris Groups substantial parts distribution center is located at the landmark Harris HQ facility in Dublin.The facility is conveniently located on the main route to Dublin International Airport o the M50 motorway and is also convenient to the deep sea port located in Dublin Port and docks.Our parts distribution centre, serves the Harris Group brands and supports our appointed dealer network, regional depots, and walk-in customers for the United Kingdom & Ireland.The Parts Distribution Centre was established in 1964 to provide timely delivery of service parts, panels, etc for our customers’ needs, and also to hold just-in-time (JIT) inventory for the J Harris Assemblers KD plant located on-site. The Harris Group combines Fast Locating and Special Handling (FLASH),along with a sophisticated in-house computer system, to pack and dispatch parts to our customers.The dedicated parts control team use advanced automated reordering systems to control the parts supply chain, which is overseen by our parts management team to control order levels, and liaise with our global suppliers to ensure that our parts distribution centre achieves our market leading 98% pick from stock.Investment in the latest technology enables the receiving, storing, picking, and shipping functions to be performed efficiently, making sure customers have the right part at the right time.